There's an adage that says "to love what you do means you'll never work a day in your life." On the other hand, they tell us that when a hobby becomes a career, fun becomes work. There's a fine line to straddle, and few are able to turn "play" into "work" without a loss of passion. Robin Tørmoen decided to play it safe; after three years in school learning the trades of mechanic, bodywork, and race car preparation, he feared that perhaps his passion for cars would wane. 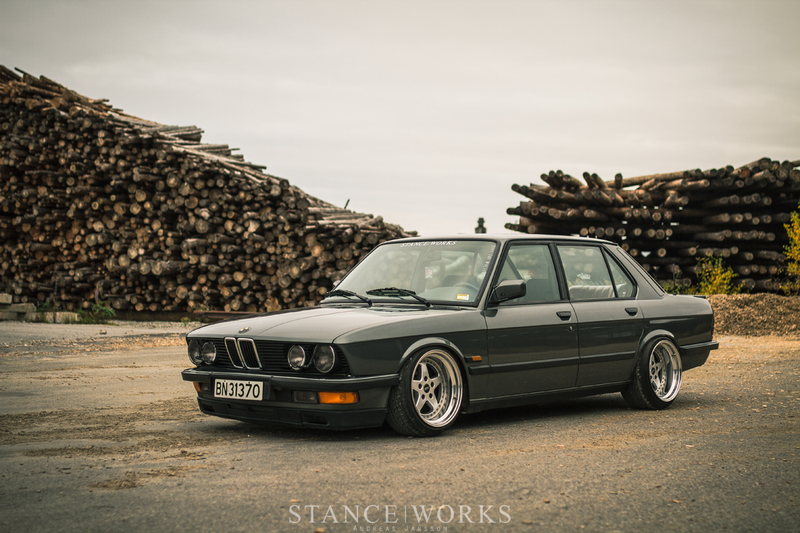 The experience he gained, however, was put to good use, yielding a one-of-a-kind E28 worthy of more than just a first look. At just 21 years old, Robin's autmotive career is self-admittedly a bit short. "I'm not a buy and sell kind of guy," he says. Instead, he prefers to see his car through to their full potential. His time was initially spent with an old Volvo 240, which received a good bit of time and money before Robin's realization that "those bricks just aren't for me." 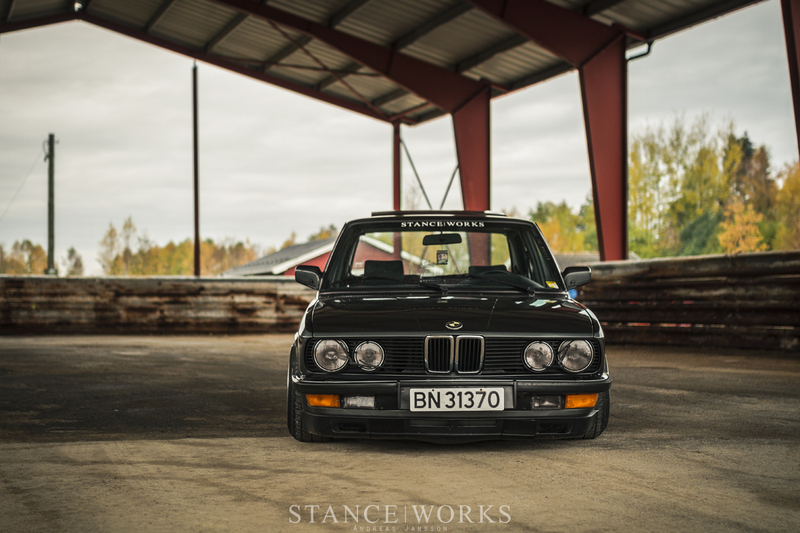 Instead, he'd surf the StanceWorks forums between classes, eventually landing him with the discernment that BMW's E28 was in fact what truly got his gears turning. 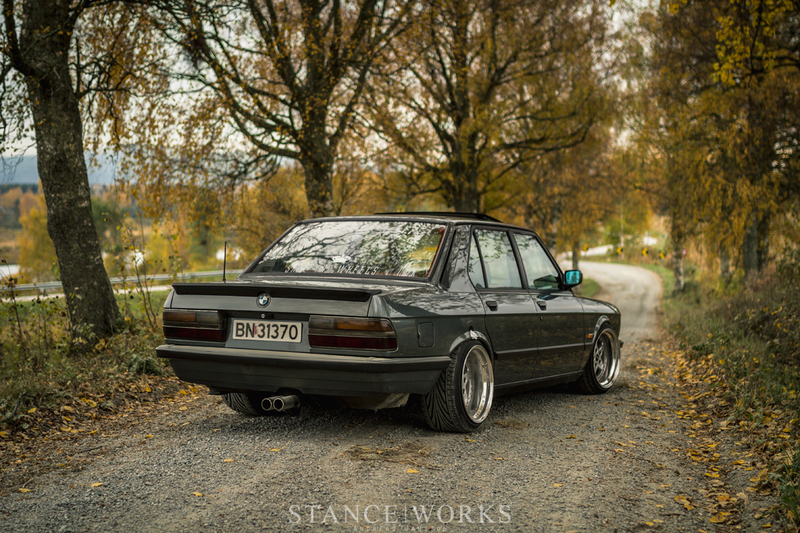 After parting ways with the Volvo, Robin had a short foray with a black, rusty E28, before earning enough to buy a better example. The black car offered him a chance to learn more about the chassis and its inner workings, but left too much to be desired when it came to building it. However, after scouring the web for quite some time, Robin found a potential replacement not far from his home of Hedmark, Norway. The online posting he found offered no info about the car, but seeing as it wasn't a far drive, Robin went to see it. Upon arrival, Robin struggled to maintain composure. When for-sale postings lack important information, or in Robin's case, any information at all, it's more-often-than-not a bad sign. In this case, however, it was quite the opposite: the uninformative posting had led him to a Dolphin Gray 520i, complete with factory shadowline trim. 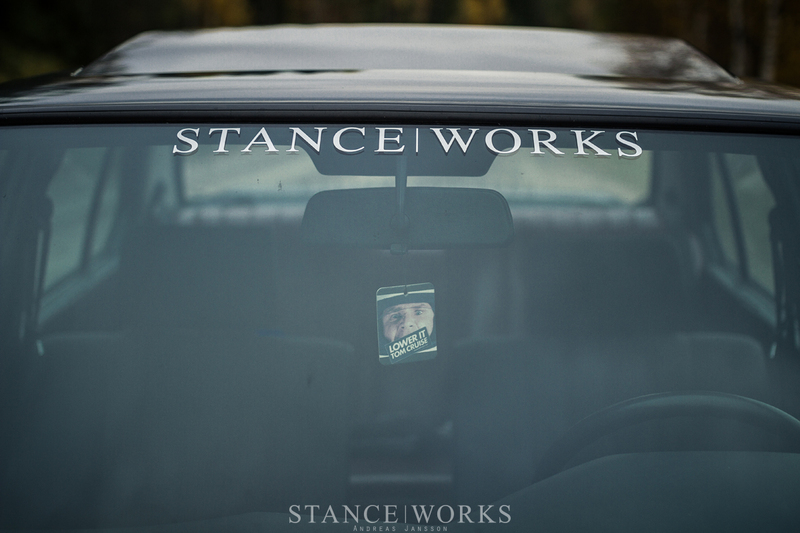 At first glance, it was clear that this particular car was more than worthwhile, but the details sealed the deal. The E28's odometer had just passed 70,000 miles, all accrued by the original owner, whom had bought the car brand new in 1987. The grey cloth interior showed no signs of wear, and the Dolphin Gray paint shined as if it were new - a tell-tale sign that the car was garage-kept and well cared for. The car was completely rust free - a special find all its own. Needless to say, Robin didn't hesitate to make the purchase. 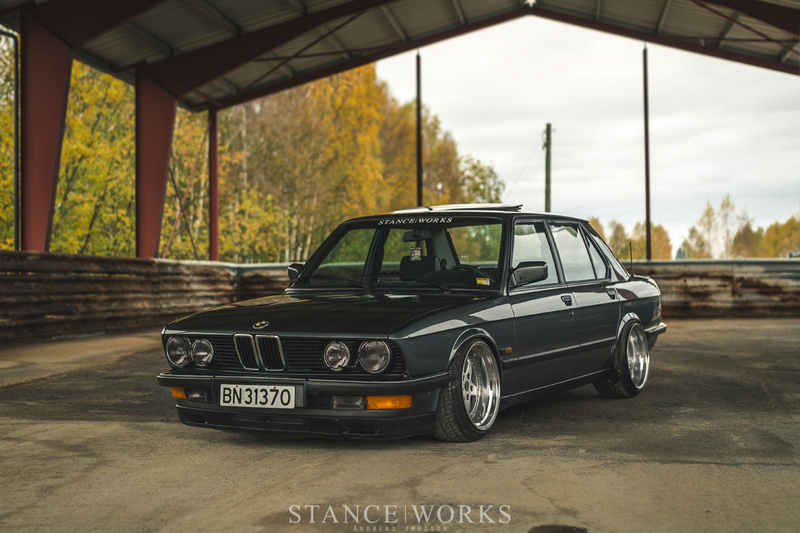 With such a well-preserved car, Robin has been hesitant to follow through with any major changes to the car. Inside, simple touches like an M-Tech steering wheel have been swapped in, but with factory perfect cloth, carpet, and trimmings, he insists he likes it just the way it is. The same goes for under the hood; with just 110,000 kilometers on the original motor, Robin isn't keen on any swaps. Instead, he's in favor of preserving the car's originality. On the other hand, Robin did take some liberties with the exterior styling and the car's running gear. 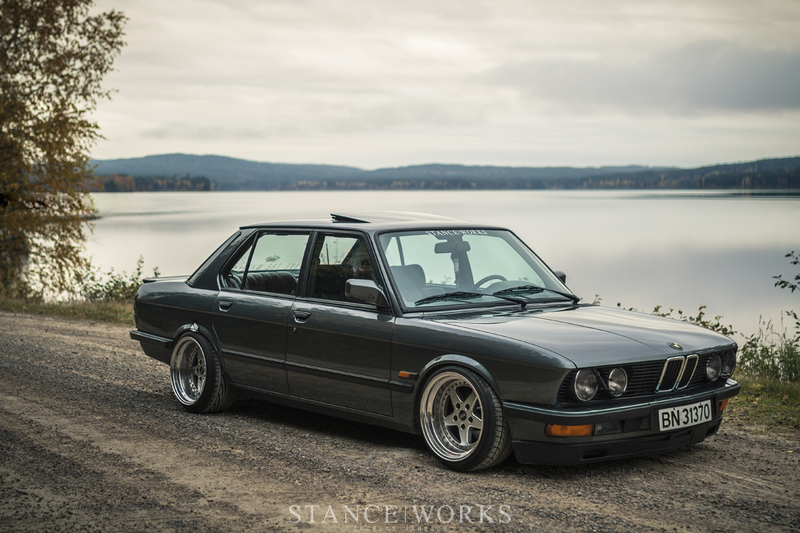 For anyone whom has set out to lower an E28, they're likely to know that it's not necessarily an off-the-shelf affair. 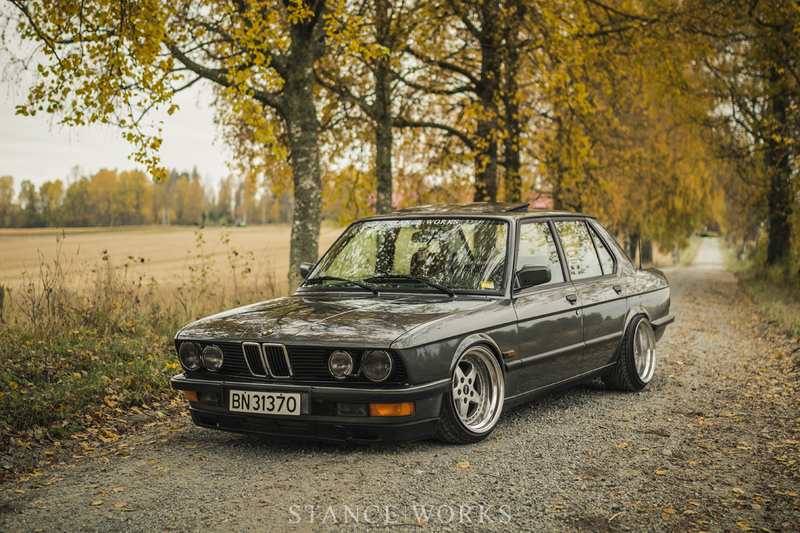 The E28 (as well as many other BMWs) have their spindles affixed to their strut housings, meaning bolt-on coilover options are few and far between. 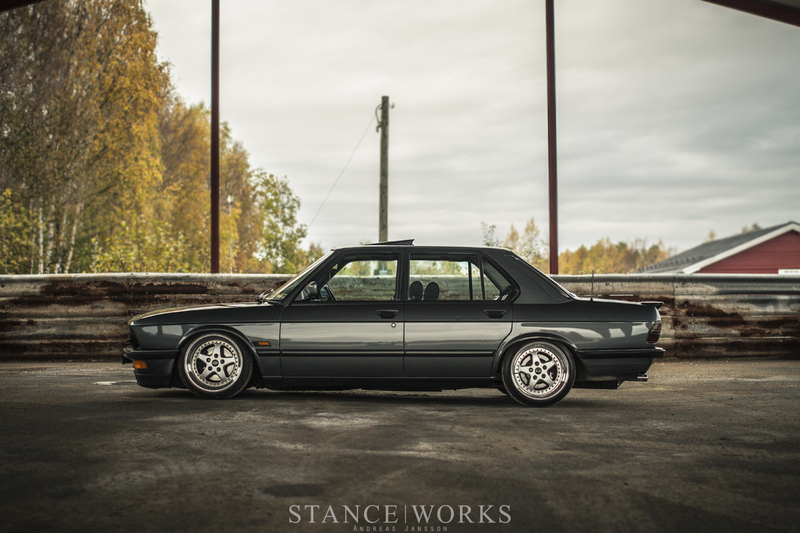 As is par for the course, Robin mated custom coilovers to his shortened factory strut housings as the basis for his car's suspension. 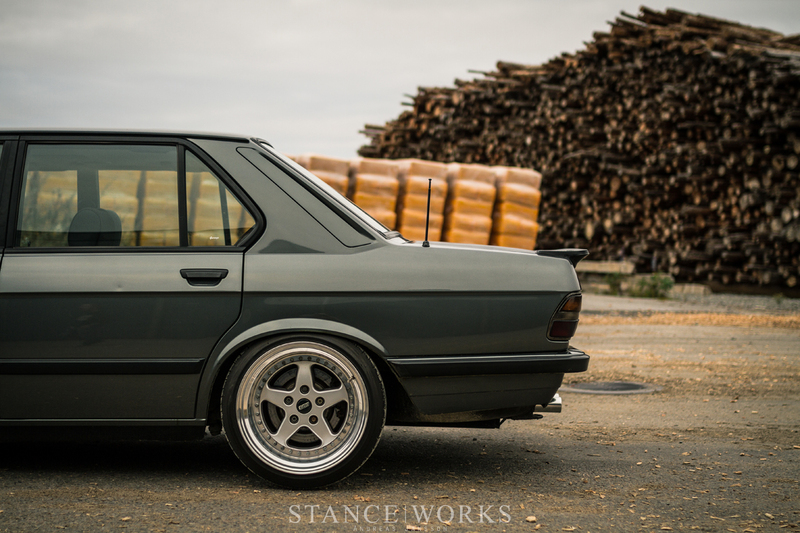 On each corner is a 5" 750lb spring, which wraps around a set of factory E30 325ix shocks. The ride is admittedly stiff, but necessarily so, to allow for the choice of wheels and tires. 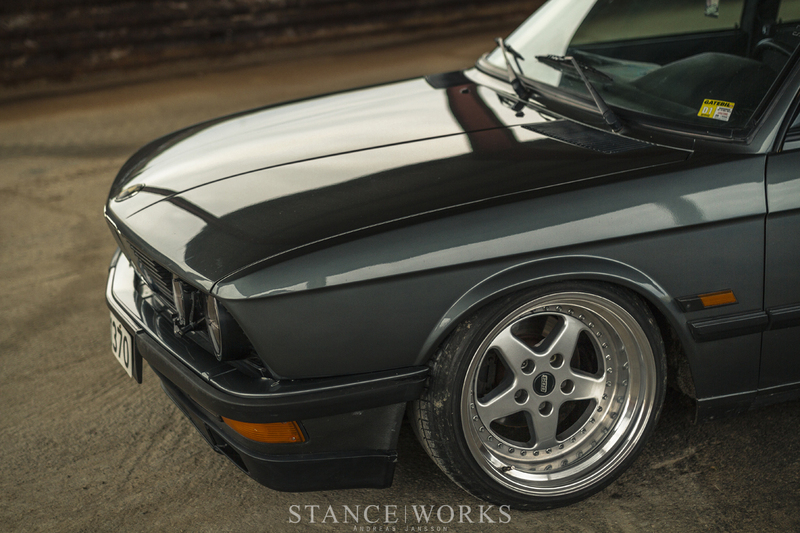 Also necessary is the set of A1 strut hats and camber plates, which Robin modified for extra clearance. 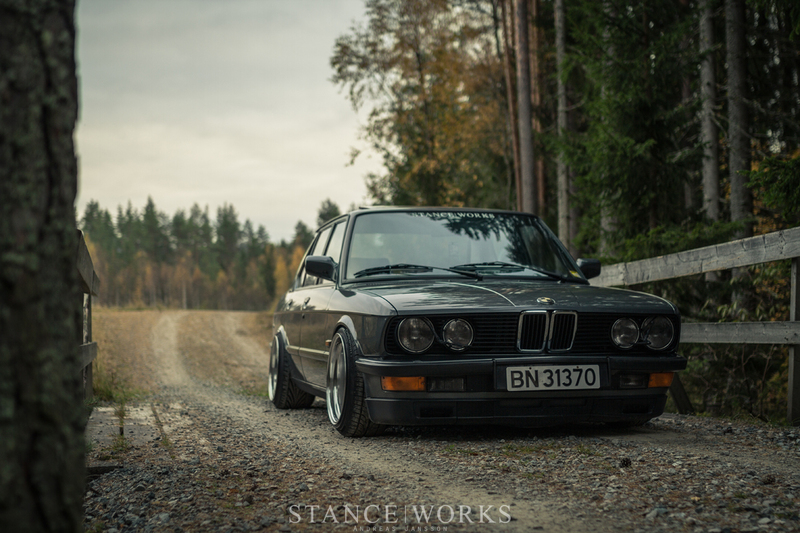 Powerflex bushings, as well as a few minor and insignificant changes to the suspension help to round the setup off. 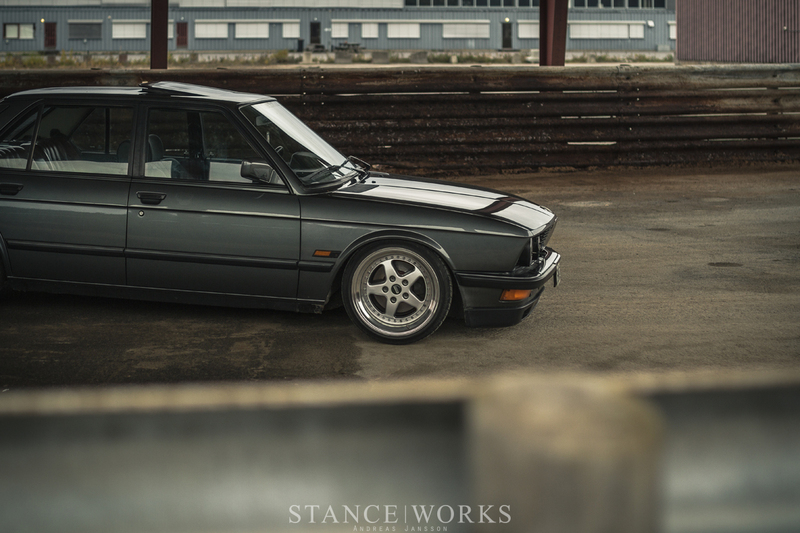 All of the above allows room for Robin's choice of very wide wheels. 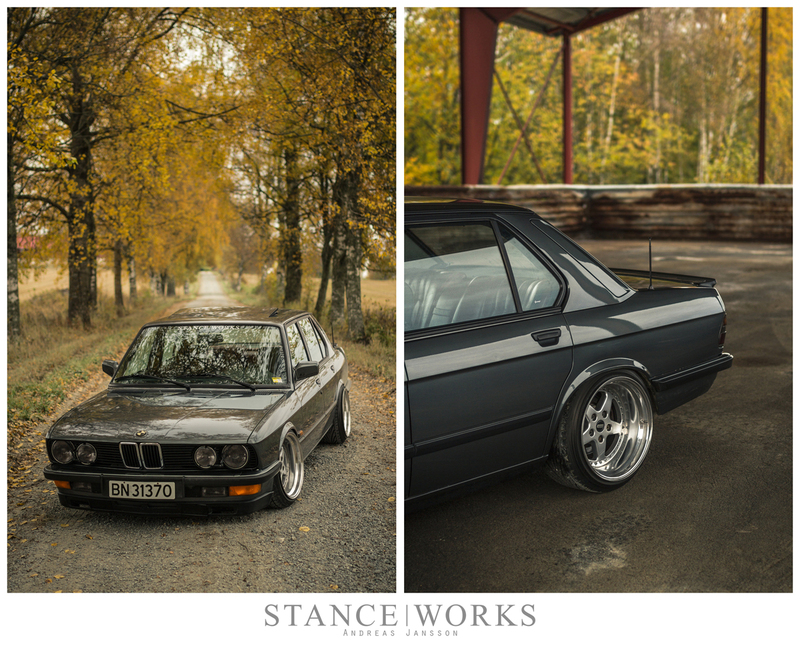 With his love for classic BMWs comes an affinity for classic quality wheels. A jaunt through his facebook page shows he's had a hand in rebuilding a number of sets, but his wheel of choice, at least for the moment, is a custom built set of BBS for Kerscher RX057s and RX058s. 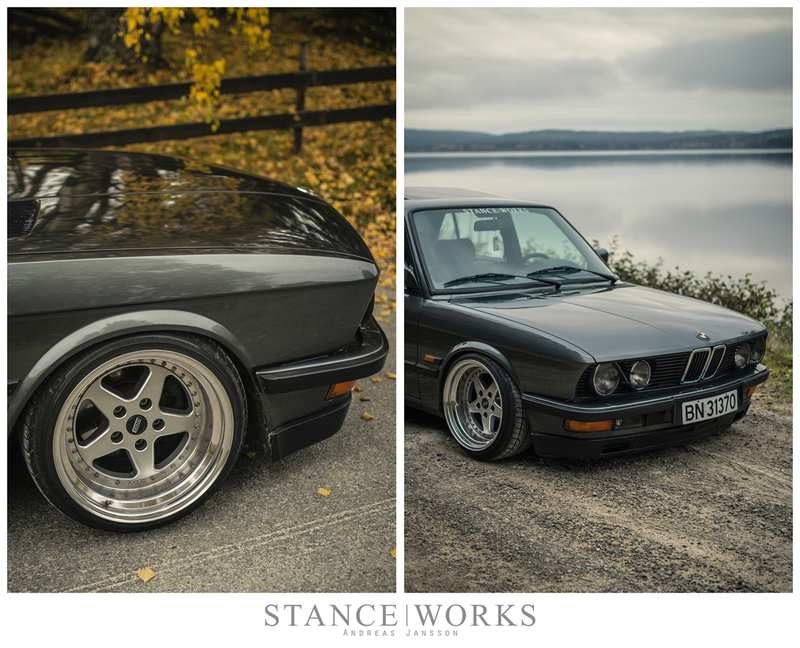 The wheels were originally 9" and 10" wide - wide by all vintage standards - but not wide enough for the style Robin sought. 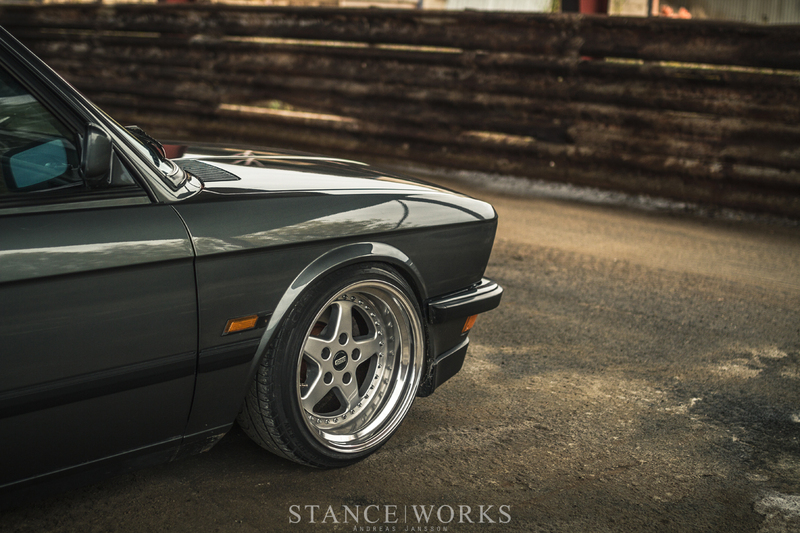 With 4" and 5" lips, he rebuilt the wheels for the front and rear respectively, and in addition, machined down the rear wheels' backpads to adjust the final sizes and offsets. The end numbers tally out to 10" et -4.5 in the front and 11" et +3.5 in the rear. 215/40s and 245/35s wrap the wheels. Robin continues to dabble with the thought of wider wheels and body work to accompany them. With his enthusiasm for classic 3-piece collectables, it very well may happen. The tradeoff is the loss of his all-original exterior, but perhaps the cost is worth it. 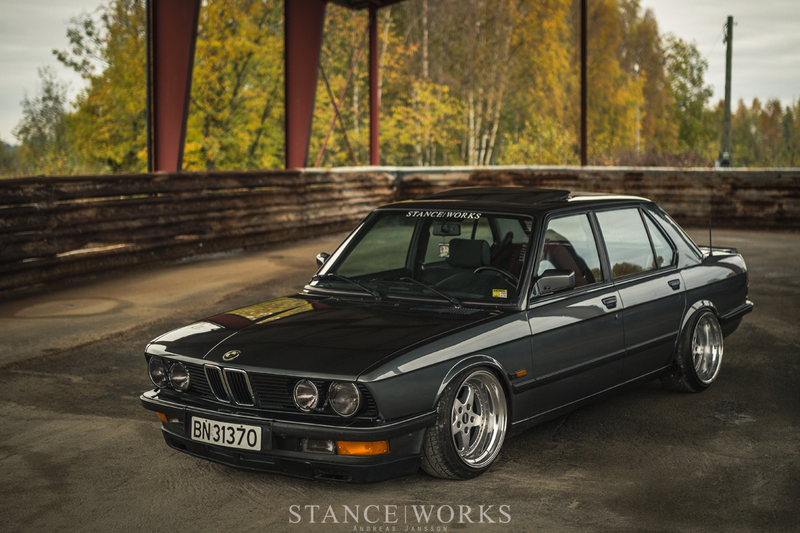 Either way, his car is sure to turn heads, just as it does now. 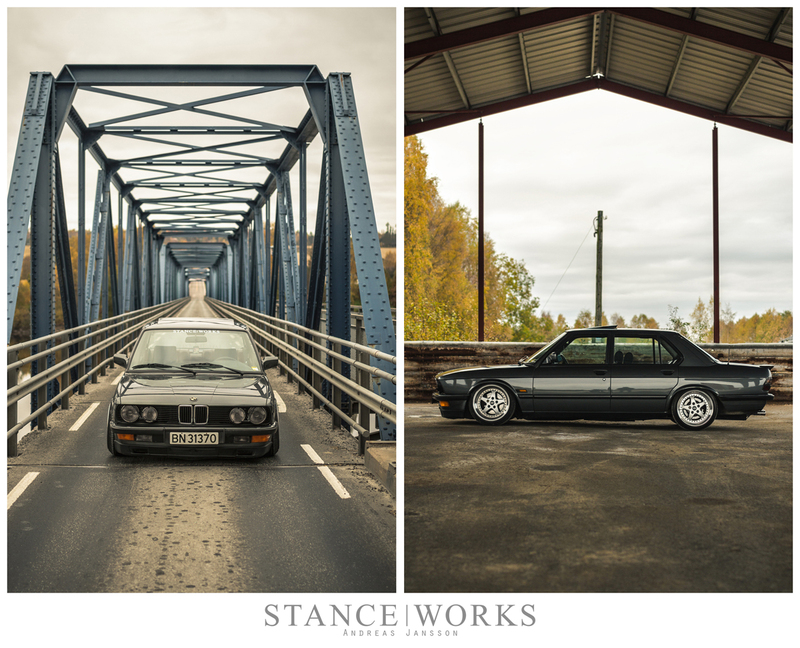 Whether stock or modified, there's something special and attention-grabbing about the classic lines of an E28. 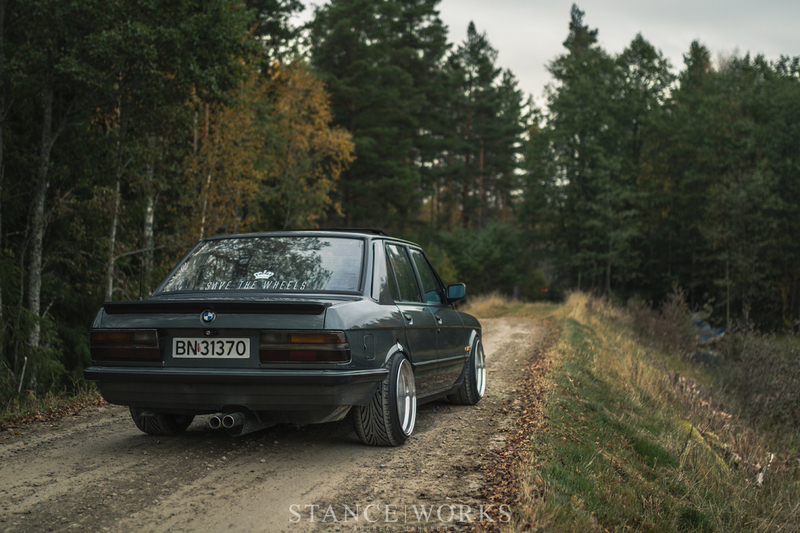 We can see why Robin chose the car as his canvas, and we're eager to see where it goes. Great set of photos Andreas. 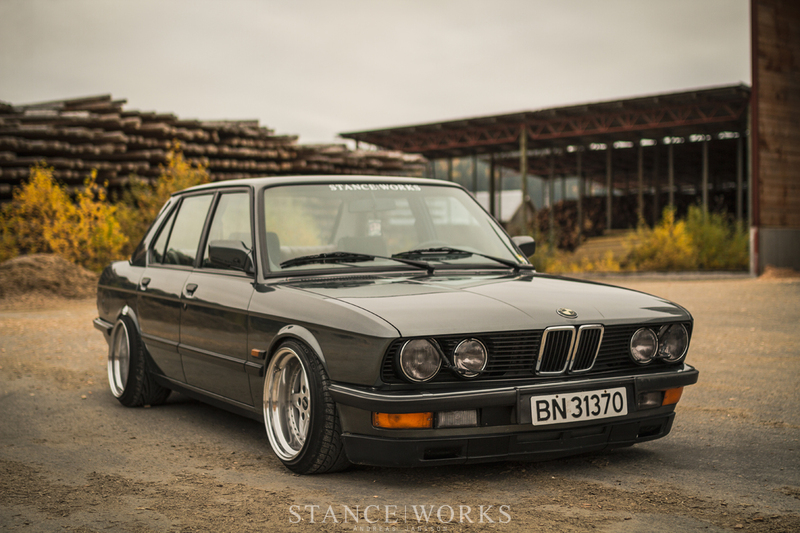 One day when I get an E28, I think this article will be to thank!